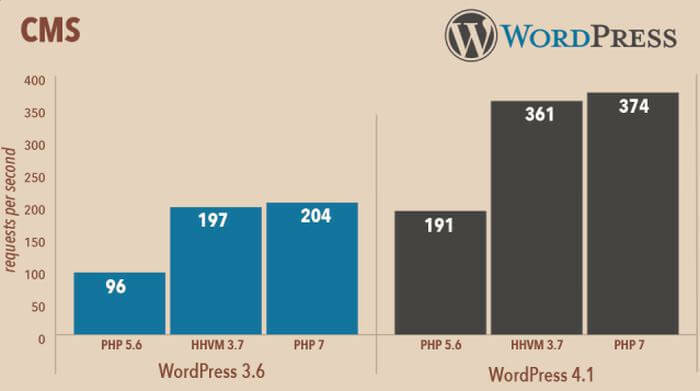 If you’re a website developer/owner running their sites on WordPress (or on any other PHP-powered CMS such as Joomla, Drupal, Magento), then you’ve landed to the right blog post. This informative guide will not only give you a taste of what’s new coming in PHP 7 but also will answer all your questions related to the new PHP version! Performance is undoubtedly the biggest reason why you should upgrade your servers as soon as a stable version is released. The core refactoring introduced by the phpng RFCmakes PHP 7 as fast as (or faster than) HHVM. The official benchmarks are impressive: most real world applications running on PHP 5.6 will run at least twice as fast on PHP 7. This is, again, an edge case and it’s more related to logic errors in your code. There’s no use for multiple default clauses in a switch, but because it never caused any trouble (e.g. no warnings), it can be difficult to detect the mistake. In PHP 5, the last default would be used, but in PHP 7 you will now get a Fatal Error: Switch statements may only contain one default clause.